Have you ever wanted to be in the skin of a world champion Might and Magic universe? Now with this pack of great online cards of Might & Magic Duel of Champions is possible. Can you master a powerful deck? This unique package brings many advantages to create one of the most powerful decks seen so far, and with the 2013 champion beat his opponents in the world tournament of cards Might & Magic Duel of Champions. This package comes with Acamas hero, with 8 events, 35 powerful creatures and 17 fortunes, to further increase the power of your deck. The M & M universe come back again with this awesome battle card game, and where we can deal with opponents from around the world to measure our skill with heroes and creatures from the fantasy world of Might and Magic. 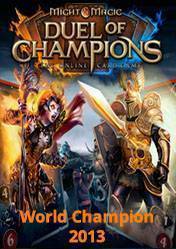 There are no comments yet about Might & Magic Duel of Champions World Champion 2013 . You can be the first one!